Litecoin has a lot of advantages. It has a drama-free community and a relatively steady trend, making it ideal for trading, spending, fundraising, or even dabbling in arbitrage. 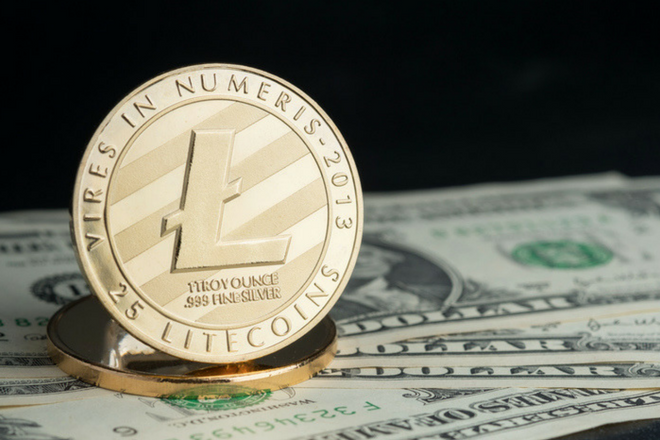 If you’ve read our article on Litecoin, you undoubtedly know that it’s similar to Bitcoin but with a few key differences. Shorter blocktime – 2.5 minutes versus Bitcoin’s standard of 10 minutes (can be much more). Lower transaction fees – Bitcoin fees became unmanageable for many in the last few months. An algorithm that uses less energy and blocks the powerful ASIC miners of BTC. A higher total supply – 84 million tokens versus Bitcoin’s cap of 21 million. Some of these improvements may have caught your eye, or perhaps you’re a fan of Litecoin founder Charlie Lee, or maybe you don’t fully understand it but simply don’t want to get left out. Whatever angle you’re coming from, this article will walk you through how to buy Litecoin. 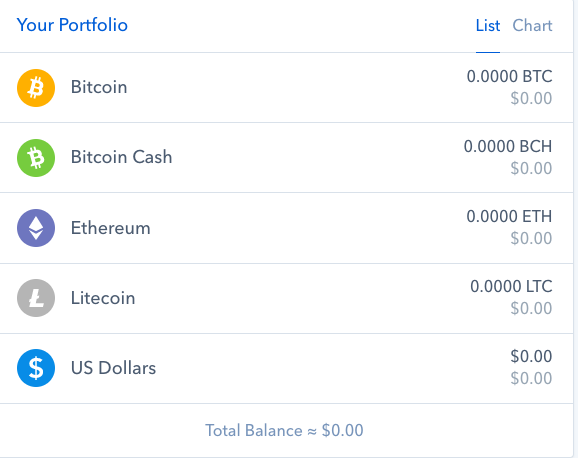 The easiest way to get started is to visit Coinbase, the default exchange for most people wishing to trade fiat currency for Bitcoin (or, controversially, Bitcoin Cash), Ethereum, or Litecoin. Note: Invest In Blockchain is not affiliated with Coinbase. There are other options, but it simply represents one of the easiest points of entry. Find a good Litecoin wallet before you buy anything. Exodus and Jaxx are popular and if you’re looking for better security for your Litecoins, you can use a hardware wallet like TREZOR or Ledger Nano S.
Join Coinbase. From the home page, you’ll want to click “sign up” in the top right-hand corner and walk through the new account processes as dictated. You’ll be asked to upload some form of ID to verify your identity, set up a two-factor authentication system for security purposes, and select a payment method. Each method has its pros and cons. Review these carefully before proceeding. Both VISA and Mastercard now charge you an additional fee for paying via credit card. From the dashboard, click on the “accounts” tab on the top toolbar. On the left-hand side, you will see these various wallets. Locate the USD one. Click “deposit” and you will see a popup that asks you to select from which source you’d like to deposit money, and the amount. Once you’ve entered the amount and selected your source, click continue. If you’re depositing via wire transfer from a US bank account, the deposit can take up to 4–5 days to process. This is worth noting if you want to get started immediately, and, if you’re curious, Coinbase explains why it takes so long in this article. To purchase, you’ll select “buy” and click the Litecoin box highlighted in green. Then you’ll choose a payment method as defined in the previous step. This can be your USD wallet or a direct buy from your account. Next, you’ll enter the amount you’d like to purchase (at the time of writing, the price is $158 dollars per Litecoin). On the right side, you’ll be able to review your purchase. This will confirm details, such as the date the purchase will become available, LTC transaction fees, Coinbase fees, and your total. 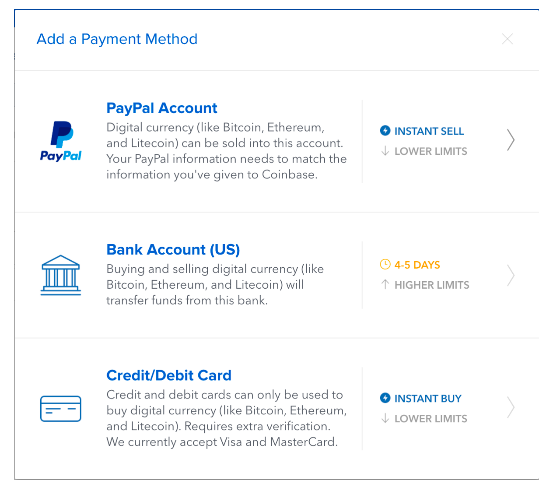 Coinbase tends to charge a little more in fees, which is why some people prefer buying elsewhere (more on this below). 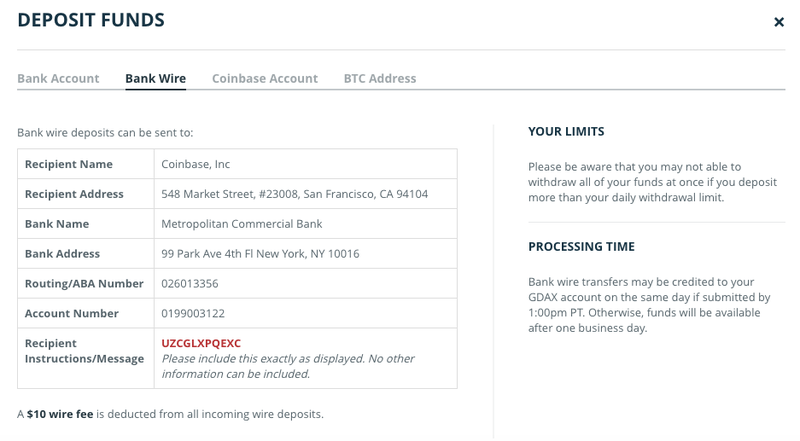 If you want to read up on Coinbase fees, click here. Once you’ve reviewed everything and ensured it’s correct, click the big, blue “Buy Litecoin” button. And that’s it – you’re now the proud owner of some LTC, which you should see in your LTC wallet shortly. You’ll probably not want to leave your purchase sitting on the exchange though, so be sure to read up on the best mobile and hardware storage options. As mentioned above, Coinbase is far from the only place you can buy Litecoin. Many people favor exchanges like Binance, GDAX, or Bittrex. They typically do so because of lower fees and the ability to trade Litecoin for a number of other altcoins. For the sake of simplicity (and continuity), we’re going to explain how to buy Litecoin on GDAX. Global Digital Asset Exchange, or GDAX, is a professional cryptocurrency exchange owned by Coinbase. If Coinbase is designed to be easy for mass-scale consumers, GDAX is designed more with the professional trader in mind – but don’t worry, it’s not hard to use. The nice thing here is you can use your same login credentials from Coinbase on GDAX. Here are some of GDAX’s trading pairs by country. You can opt for a bank wire or an ACH transfer, although there are time constraints and costs associated with each method. You can also transfer money from a wallet on Coinbase or an external crypto wallet. 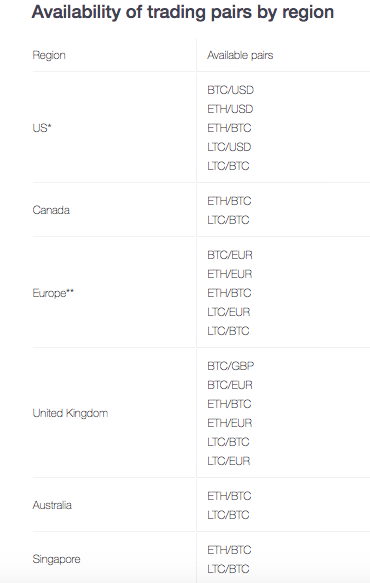 First, make sure that LTC is selected along with whatever currency you are trading (in this case, USD). You’ll notice that there are three options under buy: “market”, “limit”, and “stop”. To properly use the exchange, you need to understand how these options work. The market price is simply what two people agree to buy/sell a Litecoin at. If you select market, specify how much you want to buy, and click “place buy order”. You will be purchasing at whatever price is listed in the order book. The order book lists all the buyers and sellers currently making offers on the exchange. On the bottom in green, people are buying and on the top in red people are selling. If you go ahead with a market buy order, it will be filled immediately and you will be charged a taker fee of between .10% and .30% (sometimes volume discounts apply). You’re called a taker because someone has listed an offer and you’ve taken their offer. The limit price is simply a predefined value at which someone is willing to buy/sell. For example, you may want to buy one Litecoin but don’t want to spend more than $120 USD. In this case, you then select a limit buy and the order will only be filled once someone else agrees to sell at this price. You, as the maker, have made an offer, and as such are charged 0% in fees. Stop orders (sometimes called stop loss-orders) are the most complicated of the three options, and this is because there are more parameters that you need to set. Let’s consider an example. If you bought Litecoin, you can set a stop order if the price were to drop below $100 (in effect stopping further loss). That is to say, if the price dips drastically, you can preset a sell order on GDAX. If the last trade price drops below this point, a sell order will be triggered, either hitting the orderbook or immediately being filled. When viewed against the other top ten cryptocurrencies, Litecoin has been relatively stable and dropped comparatively less. Litecoin has always had the advantage of viewing Bitcoin as a guinea pig and learning from its mistakes and challenges. The analogy of Litecoin as silver to Bitcoin’s gold, still rings true, and it’s not hard to imagine a future where LTC is used for daily transactions. Despite selling all of his LTC, founder Charlie Lee remains 100% dedicated to the project and optimistic about its future. Although these are positive indicators, the future is impossible to predict. Take this information for what you think it’s worth, consider it against your own risk tolerance, and go with what ultimately feels right for you. Some people learn better visually and for those folks, here are a couple links to additional video resources that may be useful. 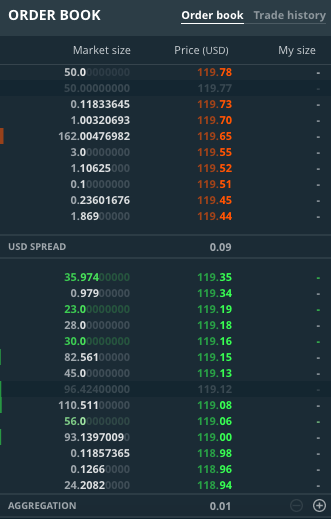 GDAX – What is The Order Book? GDAX – How Do Stop Orders Work? Thank you so much for this guide on how to create an account and buy cryptocurrency on an exchange. As an older adult, I used to think I had missed the boat on this. 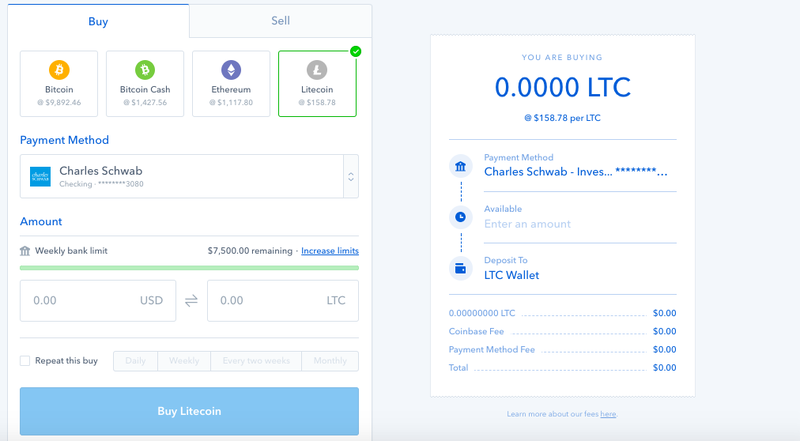 Even learning about sites like coinbase where you can buy litecoin and ethereum gives me hope. Thank you for this review, but I would like to add something. The method of acquiring LTC you described is not the easiest, there is another option, the acquisition of LTC and other coins on exchange platforms. Recently, I increasingly use their services, for example, changelly and changenow.io, where the latter looks more reliable and proven. Conveniently, there is no registration (I do not waste time and do not risk personal data), there are no limits, I can buy coins for any amount.